The above Bill is causing a massive amount of anxiety, especially the short comment period 16 January 2015 till end January 2015. The Animal Interest Alliance responds to calls by the Kzn parliamentary committee on finance for Ezemvelo KZN Wildlife to become self-funded. It is not the first time that a parliamentary committee of the province has demanded of Ezemvelo KZN Wildlife that it should “stand on its own feet” or become financially self-sufficient. As Dr Ian Player points out, there is no precedent for this nonsensical move. Indeed, when the Mpumalanga Parks Board was ordered to find its own funding some years ago, it had disastrous consequences for nature conservation in that province. Today (4th September 2012) in the High Court in Pietermaritzburg, Justice Piet Koen declared the appointment of the current KwaZulu-Natal Nature Conservation Board to be invalid. This brought to an end a lengthy court battle between the Animal Interest Alliance (AIA,) and the MEC Agriculture, Environmental Affairs and Rural Development, the Ezemvelo Board, its members and Ezemvelo KZN Wildlife. By agreement, the court was asked to suspend the declaration of invalidity of the board for six months to allow the MEC to follow due process in the appointment of a new board which must meet the requirements of the KwaZulu-Natal Nature Conservation Management Act 1997 (“the Management Act”). Were the court order to have taken immediate effect, it would have rendered all of the activities of the Ezemvelo Board and Ezemvelo KZN Wildlife illegal and would have thrown nature conservation in the province into a state of chaos. Speaking after the hearing, Jim Stockley an AIA trustee said: “We are very pleased to bring the court matter to an end. It was never our wish to create a state of chaos in the province. Our concern was and remains, that without a properly constituted board that is representative of all relevant stakeholders in the province, there is no accountability for the actions of officials in Ezemvelo KZN Wildlife”. AIA’s dispute with Ezemvelo KZN Wildlife began in 2006 when the latter attempted to introduce a policy for the keeping of wild animals in captivity which was clearly aimed at the prohibition of the keeping of any wild animals in captivity except for limited conservation purposes. The AIA contended that neither Ezemvelo KZN Wildlife nor the Ezemvelo Board had the statutory mandate to develop such a policy or to implement it as if it were law. Although this was conceded by Ezemvelo KZN Wildlife and it was abandoned under threat of legal action, it became clear that Ezemvelo KZN Wildlife intended to achieve the same purpose through the introduction of various “norms and standards” and then “standard terms and conditions” for the issue of permits for the capture and keeping of wild animals. So onerous were the “standard terms and conditions” that it made compliance virtually impossible. During the course of the dispute, it came to the attention of AIA that the Ezemvelo Board did not have the full complement of members required by the Management Act. The Management Act stipulates that the Board must comprise a minimum of nine members and that various categories of member must be filled. It appeared that from about 2003, the Board operated without its full complement, having been served until the end of 2008 by only five members and then by only four members until the end of 2009. Without its full complement of members the Ezemvelo Board could not function legally. Appointments made by the MEC during 2009 for the current board which took office from the beginning of 2010, did not follow the correct procedure and did not fill all of the categories of member required by the Management Act. It is these appointments that board that the court ordered were invalid. “Our concern was not with the legal technicalities that rendered the operations of the Ezemvelo Board, and it follows Ezemvelo KZN Wildlife, illegal. It was that without a fully-fledged and competent Board, there was no proper oversight of the activities of Ezemvelo officials and no corporate governance in province’s nature conservation agency”, says Stockley. 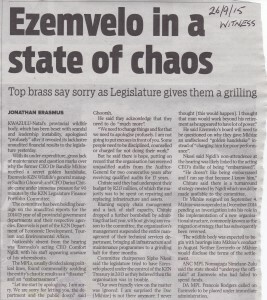 In recent times both the Ezemvelo Board and Ezemvelo KZN Wildlife have been plagued by financial and other woes. In September 2008, the then MEC suspended the entire Board and the organisation operated under the MEC’s administration. During this time, forensic audits uncovered serious financial and other maladministration within the organisation. Stockley goes on: “It is our view that had a proper board been in place, it would not have sanctioned the unlawful processes that Ezemvelo KZN Wildlife embarked upon and which forced us to take the matter to court. We did not cause the problems in Ezemvelo. We merely exposed and took before the court an illegal state of affairs that had to be brought to an end in the public interest”. Stockley points out: “When we became aware of the illegal state of affairs in the Board, our attorney approach the Legal Services division attached to the MEC. A deal was struck in May 2010 in an attempt to avoid court action, long before the matter came to court”. According to Stockley, the AIA agreed not to pursue court action to challenge the legality of the Board, provided the irregularities in the permitting procedures being applied by Ezemvelo KZN Wildlife were addressed. An agreement was apparently reached to this effect between the MEC’s legal advisor and the Executive Director: Biodiversity of Ezemvelo KZN Wildlife. However, at the first meeting between AIA and Ezemvelo KZN Wildlife to implement the agreement, it was clear that officials present had no intention of honouring the agreement reached with the MEC’s legal advisor. It was this that prompted the AIA to launch its court action in December 2010. “The pity of it is that what the court has ordered and the parties have agreed to today, is pretty much what we agreed with the MEC’s legal advisor in May 2010. The difference is that the taxpayer now has to foot a massive legal bill which will run into millions”. The court ordered the MEC to pay the legal costs of the AIA and Helmut Bruss who joined the proceedings with the AIA. The MEC will also have to cover the legal costs of the Ezemvelo Board and Ezemvelo KZN Wildlife as the court directed that although their legal expenses essentially come out of the same coffers, they will not be taken out of the nature conservation budget allocated to Ezemvelo. “While we think that somebody in Ezemvelo should be held accountable for allowing the matter to proceed as far as it did in the face of what was clearly an unlawful state of affairs, we would not like to see even more of the budget allocated to conservation being used for non-conservation purposes”. Stockley was referring to the recent disclosure to the Portfolio Committee on nature conservation that only about 30% of the Ezemvelo budget was spent directly on nature conservation activities. Stockley concludes: “We hope that through our actions, the serious problems that have beset Ezemvelo for years will now be addressed by the new MEC and that he will succeed where his predecessors have failed. This starts with the appointment of a new board that complies both procedurally and substantively with the Management Act, and is truly representative of all stakeholders who have an interest in nature conservation in the province. Most important for the AIA, is to see nature conservation back in the hands of an Ezemvelo Board that is competent and accountable for its actions and those of Ezemvelo KZN Wildlife”. Please attend this court case and show your support. FINALLY – In court WEDNESDAY 28 March 2012 – FRIDAY 30 March 2012 ….. win or lose, will this be the end of it ? Don’t hold your breath. We’ll be lucky to get a judgement any time soon. If we win then the opposition will no doubt use taxpayer’s money to launch an appeal. If we lose then we will start passing the hat to do the same ! With our court case rapidly approaching on 28 March, William’s generous assistance couldn’t have come at a more opportune time. If we don’t get the documents from Ezemvelo (which we asked for at the end of last year) by tomorrow (2 February), we may be back in court as early as next week, racking up further costs in this fight to get reasonable legislation on husbandry and permit conditions for captive animal keepers and their charges. Is there anyone out there who can match William’s donation? Now would be a good time to renew your membership ……… every cent helps. 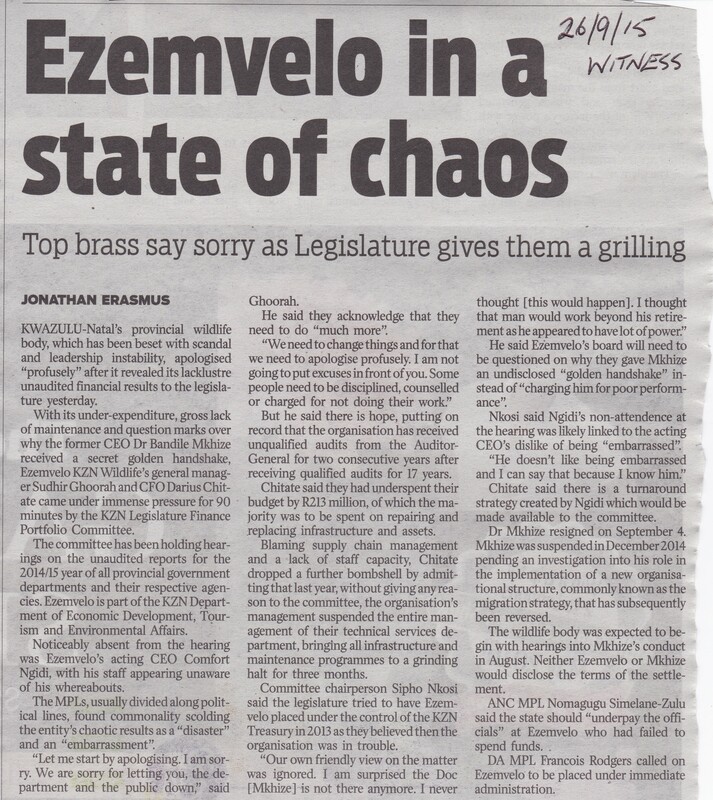 While the legal teams of the AIA and Helmut Bruss (the Applicants) geared up to argue the matter in court on 25th November 2011, it seems that Ezemvelo had other ideas. We refer to your letter dated 28h March 2011 received today. With respect, we have to disagree with the opinion of Advocate Marnewick SC. We can only assume that he was not correctly briefed. The “Board” has no employees. The officials/employees to whom you refer, are employees of the KwaZulu-Natal Nature Conservation Service (“the NCS”), established as a separate statutory body in terms of section 20(1) of the KwaZulu-Natal Nature Conservation management Act 9 of 1997 (“the Act”). In terms of section 20(2), the NCS “is accountable to the Board for the execution of its functions, powers and duties”. It is our clients’ contention, that without a validly constituted Board, the NCS cannot lawfully function. This is a matter that is before the court for a decision, so we will comment no further on this point. Apart from our comments above, undertaking the abovementioned process, is not part of the “ordinary duties and functions” of the employees. These powers, functions and duties are circumscribed by section 23 of the Act. They do not include the process in which the employees in question are engaged. We pointed out to the Premier that not he, the Board, the NCS or the CEO of the NCS, have the statutory power to engage in such a process, the validity of the appointment of members of the Board aside. Referring to the provisions of section 49 of the National Environmental Management Act 107 of 1998 is hardly an act in terrorem. It is an act of courtesy and a valid caution to the officials concerned. We do not understand how our clients’ challenge to your clients’ actions in the current process can reflect on the question of costs in the matter before the court. We therefore offer no further comment on this issue. Our clients deny making any statements about your client animus iniuriandi. All comments made by our clients are true where they are factual, legitimate where they are criticisms and are made in the public interest. To the extent that your clients have the legal right to institute court action, any such action will be dealt with appropriately. The officials concerned may proceed at their peril. In the interests of not distracting the focus of the parties (and the public) from the matter in court, we will recommend to our clients that they call a truce on any further comments about your client’s conduct if your clients call off all meetings in the process referred above until the litigation is complete. Since our client does not recognise your clients’ right to embark upon the process concerned in the first place, or the legitimacy thereof, our client will continue to take the matter up with the Premier until the process is terminated. We represent the Animal Interest Alliance (AIA) as you are probably aware. You are cited as the Fourth Respondent in High Court proceedings between the trustees of my client against the MEC Agriculture, Environmental Affairs and Rural Development (“the MEC”), the KwaZulu-Natal Nature Conservation Board (“the Board”), the KwaZulu-Natal Nature Conservation Service (the latter two respondents being referred to collectively as “Ezemvelo”), and others. We have addressed correspondence relating to the abovementioned process which appears to be co-sponsored by your office and Ezemvelo, to Ezemvelo and the State Attorney who represents you in the court proceedings. A response was received from the Acting CEO of Ezemvelo but not from the State Attorney. Copies of the exchange of correspondence are attached for your ease of reference. As you should be aware, in the court proceedings, my clients seek inter alia, to have the appointment by the MEC of all of the members of the Board, set aside by the court. While it is premature to determine the outcome of the proceedings, on the information provided by the MEC under the court order obtained on 8th February 2011, the validity of the appointment of all of the current Board members is in serious doubt. On 14th December 2010, your office together with the CEO of the KwaZulu-Natal Nature Conservation Service, representing the Board, addressed a letter to stakeholders in the abovementioned process inviting them to participate in the development of new procedures and standard terms and conditions for the keeping of animals in captivity in KwaZulu-Natal. A copy of the relevant letter is attached for your ease of reference. A notice inviting participation in the process was also published in the local press. In view of the uncertainty of the validity of the appointment of the Board, and the court action which had been launched, our clients considered the timing of the process inappropriate. Furthermore, the public participation process, which included the consideration and commenting on nearly 100 pages of documentation, was to be undertaken within 30 days which spanned the festive season. Our clients considered this unreasonable and contrary to the spirit of consultative governance implicit in such processes. Ezemvelo was invited to withdraw the process but has declined to do so. The lack of any response from the State Attorney indicates either that you are unaware of our clients’ objection to the process, or you have chosen to allow the process to continue. In either event, the courtesy of a reply would have been appreciated. A meeting of “experts” has been convened for 25th March 2011,to which most stakeholders who have an interest in the keeping of animals in captivity, have been invited. It is to be held at the Royal Natal Yacht Club, a private venue, when adequate and more appropriate public venues (including those at the Ezemvelo Head Office) are available at no cost. It is a concern of our clients that yet again, the meagre resources of Ezemvelo are being squandered on a process that will have no meaningful outcome. The proposed procedures and standard terms and conditions will apply to all permits, licences and registrations under the relevant legislation, being the KwaZulu-Natal Nature Conservation Ordinance 1974 (“the Ordinance”) and the Threatened or Protected Species Regulations 2006 (TOPS) read with the National Environmental Management: Biodiversity Act 10 of 2004 (“NEMBA”). “A permit issued in terms of provincial legislation by a provincial department that is an issuing authority in terms of regulation 3 for a restricted activity involving a listed threatened or protected species is regarded as a permit issued in terms of the Biodiversity Act and these regulations”. In terms of regulation 3 of TOPS the issuing authority (in the case of KwaZulu-Natal) is the First Respondent. Logically therefore, the First Respondent has the responsibility to conduct the process embarked upon by the Fourth Respondent with the Second Respondent. The Fourth Respondent’s powers are governed by section 127 of the Constitution. He may exercise only those powers that are entrusted to his office by the Constitution or any legislation. The administration of permits, licences and registrations under the Ordinance and TOPS, fall exclusively under the purview of the First Respondent and not the Fourth Respondent. In the administration of TOPS, the First Respondent is undertaking a function entrusted to her by national legislation and she is accountable to the national minister for the performance thereof. This is not a function of the executive assigned to her by the Fourth Respondent in terms of section 133(1) of the Constitution. Permits, licences and registrations under the Ordinance in which the Fourth Respondent may have an interest fall under the CEO (Director) of the Second and/or Third Respondent, who in turn is accountable to the First Respondent. The Fourth Respondent has no statutory right to participate in any aspect of the administration of this legislation. In any event, for the reasons stated above, the permits, licences and registrations issued under the ordinance are deemed to be integrated permits under regulation 4 of TOPS. The Fourth Respondent plays no part in the administration of this legislation. We urge you to take the necessary steps to bring the process to a halt before further public resources are wasted yet again by Ezemvelo at a time they can least afford it. We have threatened the officials concerned that we will seek the wasted costs of the various abortive processes from the officials concerned in their personal capacities under section 49 of the National Environmental Management Act 107 of 1998. We will also rely on the judgement of the court in the matter of Coetzee v National Commissioner of Police And Others (GNP) North Gauteng High Court, Pretoria, 2009 November 15, 17 2010 October 11, where Du Plessis AJ held that costs de bonis propriis can be made against government officials where their actions are unlawful and caused litigation and costs in respect thereof. The Court held that the Taxpayer should not be made to bear costs for unlawful, indiscriminate and illegal actions committed by government officials and that public officials acting in bad faith and causing unnecessary legal costs and litigation should be held accountable therefore. This applies also to government officials who act in breach of the constitutional imperatives contained in sections 38, 195(1), 237 of the Constitution. Such orders may constitute “appropriate relief” as contemplated in s 38 of Constitution and, as indicated by the learned judge, may act as a deterrent against public officials acting unlawfully and in bad faith. We are instructed to serve notices on your office, the office of the MEC and Ezemvelo under the Promotion of Access to Information Act 2 of 2000 calling for all documentation relevant to the decision taken to embark upon the process, copies of minutes of meetings and resolutions taken, budgets presented and approved and all documents presented in order to motivate for and solicit your support for the process. We will also seek records of all costs incurred in the process to date, including the placing advertisements in the local press. If it is found on the basis of the documents produced under the Promotion of Access to Information Act that officials have acted without proper authority (particularly in view of the tenuous claim of the Board to its validity), they will be held personally financially accountable. The matter will also be referred to the Auditor General and the Public Protector for action. Your urgent response to this letter is requested. If you do not terminate or at least suspend the process until the court matter underway is concluded, our client will take such steps as may be necessary to prevent the process from continuing. We have provided copies of this letter to your Director General Mr NVE Ngidi and to the Provincial Chief State Law Advisor (Chief Director), Advocate J Wolmarans so as to ensure that the matter is brought to your attention as a matter of urgency. As a matter of courtesy, the letter is also copied to the State Attorney, the MEC and Ezemvelo. As you should be aware by now, we act for the Animal Interest Alliance. We refer to the notices that appeared The Mercury and in The Witness on 14th February 2011 and the days following, inviting nominations for appointment to the KwaZulu-Natal Nature Conservation Board in four categories prescribed by the KwaZulu-Natal Nature Conservation Management Act 9 of 1997 (“the Act”). It was only on Friday 25th February 2011 that it was drawn to our attention that the notices are fatally defective. The notices call for nominations by “Friday, 28th February 2011″. This is a material error and is prejudicial to all persons reading the notice and wishing to respond. You are invited to withdraw the notices and to re-advertise in due course. However, before you do so, you are invited to consider carefully the provisions of the Act before so doing. In particular, you must, with respect, follow the letter of the law or your actions will be judicially reviewable. As you are well aware, there is already an application before the High Court which deals inter alia with your past indiscretions in not adhering to the strict conditions imposed by the Act. For your assistance, we draw your attention to the matters that follow. Section 4(4)(a) of the Act requires you to “invite submissions from members of the public of the names of persons who could be taken into consideration when appointing members to the Board”. “Inviting submissions” and “calling for nominations” are subtly different and you should follow the wording of the Act as you are bound by it. Section 4(4)(b) requires you to “prescribe the method which will enable the invitation contemplated in paragraph (a) to reach the greatest number of residents in the province”. Our first complaint on this issue is that you have not disclosed the method you have determined to give effect to the requirement that the invitation reaches the greatest number of resident in the province. Our second complaint is that if the only method you have prescribed, is to communicate your invitation to the residents of the province by publication in the popular press, this is inadequate and does not comply with the Act. Your invitation will not reach the greater population of the province who reside in rural areas and are those most affected by the functions of the Board. Finally, we submit that a period of two weeks within which to allow the public to consider suitable persons as members of the Board, to canvass them, and for the candidates to consider whether or not they are prepared to allow their names to be put forward, is hopelessly inadequate. If you allow your notice to stand and act on it, your decision will be taken on judicial review, either by consolidating the application with the application already before the High Court, or in a separate application for review. This letter is addressed to directly as we have had no response to any communications addressed the State Attorney on matters of similar importance and urgency. Should you refuse to agree to withdraw the notices, we will advise our client to place an advertisement with the same prominence in the same newspapers in which your advertisements were placed, advising the public that your notices are defective and should be ignored for the reasons set out in this letter. Your urgent response is requested. We refer to previous correspondence in this matter and to the Order of Court made on 8th February 2011. It was with considerable surprise that we read in The Mercury and in The Witness today that the MEC is advertising for nominations for appointment to the KwaZulu-Natal Nature Conservation Board in four categories prescribed by the KwaZulu-Natal Nature Conservation Management Act. Our clients have persistently complained to the MEC in correspondence and contend in the papers before the Court, that the absence of these categories of persons on the Board has rendered it legally dysfunctional for many years. In short, it has no statutory mandate, has operated unlawfully and all of its operations are void ab initio. The publication of these notices amount to a concession by the MEC that the composition of the Board is fatally flawed as it is now and has been since 2004. It would appear from the appearance of the logo of Ezemvelo KZN Wildlife on the advertisements that the Second and Third Respondents in the litigation have also conceded defeat. We call upon you to provide reasons for publishing these notices now, given that they are within the compliance period of the Court Order. By her actions, the MEC has conceded that she has no defence to the claims made in the application before the Court. It is a waste of public funds (yet again), to leave her surrender until the eve of a court hearing. Considerable costs have been incurred in this matter already and it is irresponsible to allow the litigation to continue in the circumstances. Our clients will not abandon the court application or condone non-compliance with the Court Order of the 8th February 2011. Unless the MEC is able to demonstrate through the production of the documents sought, that the appointments of all Board members are valid, our clients will seek their removal from office. In the meanwhile, Ezemvelo KZN Wildlife (as a Board and as the KwaZulu-Natal Nature Conservation Service) is operating unlawfully. This is of great public concern and requires decisive, transparent and urgent action by the MEC. It follows that the Procedures and Standard Terms And Conditions For Keeping Animals In Captivity In Kwazulu-Natal, has no legitimacy and must be terminated. As pointed out in our letter of 23rd December 2010, the Premier has no statutory mandate in the matter and it cannot be conducted by his office. The public has a right to be relieved of the burden of commenting on a document that has no legal status. Please respond urgently. This letter will be brought the attention of the Court as it has an important bearing on the question of costs which are exacerbated every day the legal proceedings endure. Because it is in the public interests, this letter will be published on our clientâ€™s website and will be made available to the media. EKZNW respond via media release and our reply. The KZN Nature Conservation Board, together with Ezemvelo KZN Wildlife, will contest a KZN High Court action brought by Messrs W A Horsefield, R A Franz, A R Wright, A L Lambiris and J R Stockley seeking (amongst other issues) to declare the appointment of the Board and all subsequent actions and decisions made by it, to be invalid. The KZN Nature Conservation Board, and Ezemvelo KZN Wildlife will continue to operate according to their full mandates until such time as the High Court declares otherwise. The Board and Ezemvelo KZN Wildlife respect the legal process, including any High Court ruling regarding this issue..
Our Response to the above…. Ezemvelo KZN Wildlife – what mandate? The Animal Interest Alliance and its trustees, together with its overwhelming body of support that is committed to terminating the continuing unlawful activities of Ezemvelo KZN Wildlife (in its blurred capacities of board and nature conservation service) will continue to pursue their mandate through the courts and to hold accountable those officials responsible for serious abuses of power, financial irregularities and maladministration in this public body that once was the pride of the province, but is now its pariah. As you are aware, we act for the Animal Interest Alliance and its trustees. This letter is written to you in your capacity as Chief Executive Officer (“CEO”) of the KwaZulu-Natal Nature Conservation Service which is established in terms of section 20 of the KwaZulu-Natal Nature Conservation Management Act 9 of 1997 (“the Act”), and in your personal capacity. Your appointment as CEO in terms of section 22 of the Act is made by the MEC Agriculture, Environmental Affairs and Rural Development (“the MEC”) “in consultation with the Board“. in the court papers lodged and served on the MEC, the “Board”, the KwaZulu-Natal Nature Conservation Service and others, the legitimacy of the current Board is challenged. We are in receipt of your Notice of Opposition on behalf of the First and Fourth Respondents. We have two issues that require an urgent response from your clients. Our citing of the Sixth to Fifteenth Respondents was based on information provided by the office of the First Respondent in response to notices issued under the Promotion of Access to Information Act 2 of 2000 (“PAIA”). The people shortlisted and submitted to the selection committee for consideration for appointment to Second Respondent (“the board”) are cited in the application before the court. In the absence of any other information on the appointees of the board, our assumption was that the ten people listed, were the ten people appointed. In lengthy papers filed in the Pietermaritzburg High Court on Friday 17th December 2010, the Animal Interest Alliance (“AIA”) claims that the appointment of the Board of Ezemvelo KZN Wildlife by MEC Lydia Johnson is invalid and must be set aside by the court. The matter will come before the High Court on 20th January 2011 unless it is opposed. It is alleged that the MEC did not follow the procedure stipulated in the KwaZulu-Natal Conservation Management Act 1997 (“the Act”) and that the statutory requirements that determine the composition of the Board have not been met. In his affidavit, William Horsfield, chairman of the AIA, points out that the law requires the MEC to determine a process to ensure that her invitation to the public, to put forward names for consideration for appointment to the Board, reaches “the greatest number of residents of the province”. It is alleged that many stakeholders who have a keen interest in the conservation of the wildlife resources of the province were excluded from the nomination process. Key stakeholders who must be represented on the Board include organised agriculture in the province, the House of Traditional Leaders and community based organisations from rural areas. It is alleged that the Board lacks this representation and moreover, that it does not have within its ranks, expertise stipulated by the Act in the field of environmental law, or generally to enhance its competence. Mr Horsfield concludes that with the exception of Mrs Di Dold, former conservation director of the Wildlife and Environment Society of Southern Africa, none of the board members have a demonstrated interest in nature conservation as required by law. The court application by the AIA brings to a head a dispute that began in mid 2006 when Ezemvelo KZN Wildlife attempted to introduce a broad policy to regulate the keeping of wild animals in captivity, the effect of which would have been to ban the keeping in captivity of all wild animals, indigenous and exotic, except under strict conditions determined solely by Ezemvelo KZN Wildlife. The legal power of Ezemvelo KZN Wildlife to determine such a policy was challenged and eventually abandoned in mid 2007. However it became clear that Ezemvelo KZN Wildlife had not abandoned its policy and began fixing impossible conditions to permit applications. Mr Horsfield complains in his affidavit “The actions of the Second and Third Respondents (the Ezemvelo KZN Wildlife Board and the Nature Conservation Service) adversely affect the rights of the Applicant, its members and any member of the public wishing to keep a wild animal in captivity. By setting impossible requirements, the Second and Third Respondents are effectively denying applicants for permits of the right to a fair application procedure and the legitimate expectation that such a permit will be granted on fair and reasonable conditions, consistent with permits and/or licenses traditionally issued”. He goes on to state: “I submit that the conduct of the Second and Third Respondents discloses acts of bad faith and exposes a hidden agenda intended to enforce the policy, the effect of which is engineered to prohibit the keeping of wild animals in captivity altogether”. During the dispute the AIA discovered that the board of Ezemvelo KZN Wildlife had comprised only five members instead of the mandatory nine members for some years. This means that Ezemvelo KZN Wildlife has operated unlawfully from 2004 and that all of its actions during this period are invalid. The matter was compounded by the fact that the board was suspended by former MEC Mtholepi Mthimkulu from 18th September 2008 until its reinstatement on 19th June by the High Court. In this matter, Mr Justice Wallis commented that the board did not have its statutory nine member complement. 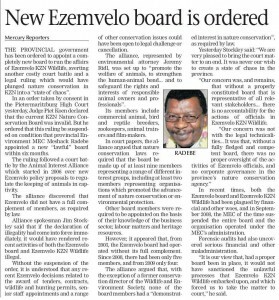 The implications for the province of Ezemvelo KZN Wildlife having operated without a validly appointed board since 2004, and continuing to do so under the present board, are massive. It renders all of the activities of Ezemvelo KZN Wildlife unlawful. Of particular concern to the members of the AIA is the implementation and administration of the Threatened or Protected Species Regulations (2006) in the province. The MEC is the issuing authority for all permits under the regulations. However Ezemvelo KZN Wildlife is carrying out her duties under the regulations without a proper delegation of authority to do so. This means that all permits issued by Ezemvelo KZN Wildlife are invalid. The AIA raised its concerns about all of these matters on many occasions with the present and former MECs, the Premiers and national Ministers of Environmental Affairs, to no avail. Mr Horsfield, commenting on the conduct of the MEC, the Ezemvelo KZN Wildlife Board and the Nature Conservation Service says: “All three are demonstrably grossly out of touch with their statutory mandates and in the case of the Second Respondent (the Board) have acted beyond their statutory powers. The conduct of the Second Respondent is apparently supported and endorsed by the First Respondent (the MEC)”. The Premier and the Minister of Water and Environmental Affairs are also criticised “for their failure to exercise political oversight in the matter when this was clearly within their constitutional obligations and functions”. It is ironic that on the same day as the launch of the court action by the AIA, the Premier, with the Chairman of the Ezemvelo KZN Wildlife Board invited comment on proposed new “Procedures and Standard Terms and Conditions for applications and authorisations for keeping animals in captivity in KwaZulu-Natal”. This is the first acknowledgement by the powers that be that the complaint of the AIA that the process adopted by Ezemvelo KZN Wildlife hitherto has been invalid. The immediate difficulty facing the Premier is that the very existence of the Board, to whom he has entrusted the public consultation process and ultimately the administration of applications for authorisations for the keeping of animals in captivity, is under threat. Mr Horsfield explains that court action has always been a last resort for the AIA. He says that despite the substantial interest it has in the conservation of the province, the MEC has not taken it seriously. The final straw for the AIA and its members was that despite have participated actively in the defunct policy process, and having been instrumental in its abandonment, the MEC chose not to disclose to it or to its members her intention to appoint a new board. Mr Horsfield says that the AIA “launches this application with a measure of reluctance but it is compelled to do so as it appears that the malaise that has plagued the management of the Second and Third Respondents for more than five years will not be addressed by the First Respondent until she is ordered to do so by the court”.